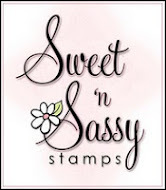 Sweet N Sassy Stamps. Our theme this week is: Layer It Up. I chose this digi image called Rose Blossom and would like to thank Sweet N Sassy for providing our images! Please be sure to check out their wonderful products!! I used scraps from my stash to make my card (I'm forever trying to use them up!!) I colored the image with Copic markers and layered it on multiple layers. 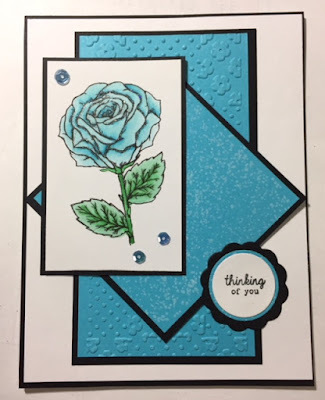 The sentiment stamp is from Fun Stampers Journey. I added a few sequins and a touch of glitter on the flower for embellishment. Please be sure to visit this week's challenge to see the other wonderful inspiration from the design team members and get your project uploaded for a chance to win a prize from our sponsor. As always, thank you so much for stopping by, and have a wonderful day. Wishing you many blessings in the new year! This is so pretty. I love the blue colors on the neutral background. Makes it pop beautifully.